This machine automatically grinds both ends of longer springs simultaneously. 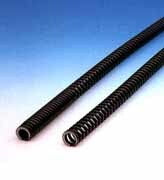 It also eliminates the need to fabricate a different spring holder for each free length. The use of a self cooling grinding wheel (pat. pend.) speeds up the process.